Live from the Royal Albert Hall, a Prom celebrating and reinterpreting the music of David Bowie with Berlin-based group Stargaze and its artistic director, Andre de Ridder. Ensemble: s t a r g a z e.
Performer: Neil Hannon. Performer: Amanda Palmer. Ensemble: s t a r g a z e.
Performer: Conor O'Brien. Ensemble: s t a r g a z e.
Performer: Neil Hannon. Performer: Elf Kid. Ensemble: s t a r g a z e.
Performer: Marc Almond. 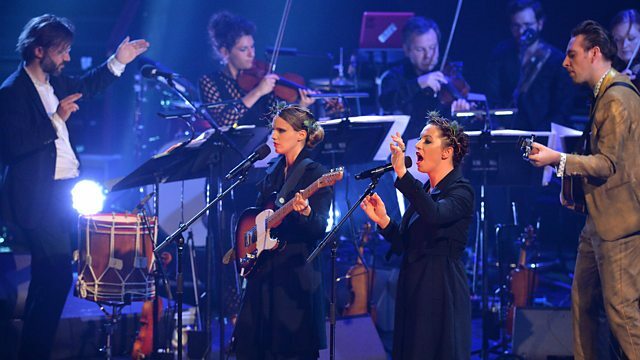 Ensemble: s t a r g a z e.
Performer: s t a r g a z e. Performer: Anna Calvi. Performer: Jherek Bischoff. Performer: s t a r g a z e. Performer: Paul Buchanan. Performer: s t a r g a z e. Performer: Laura Mvula. Performer: Laura Mvula. Ensemble: s t a r g a z e.
Performer: Paul Buchanan. Ensemble: s t a r g a z e.
Performer: s t a r g a z e. Performer: Amanda Palmer. Performer: Anna Calvi. Performer: Anna Calvi. Performer: Jherek Bischoff. Performer: Jherek Bischoff. Performer: s t a r g a z e. Performer: Amanda Palmer. Performer: Anna Calvi. Performer: Jherek Bischoff. Performer: s t a r g a z e. Performer: Philippe Jaroussky. Performer: s t a r g a z e. Performer: Marc Almond.